Founded in 1979, Q.E.P. Co., Inc. manufactures and distributes a complete line of flooring tools and accessories to the best Home Centers and Distributors around the world. We carry over 4,000 different items under the brand names: Q.E.P.TM, RobertsTM, and O'ToolTM. Strategically located facilities across the Unites states ensure that we are "local" to our customers and shipping lead times are a short as possible. International locations in Canada, Holland, Australia, New Zealand, Argentina, Chile, England, France and Germany have further expanded our reach and enable us to serve our international customers with local people in their own markets. Always on the cutting edge of innovation, the Q.E.P. 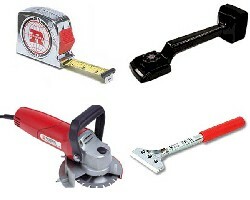 brand can be found on millions of tile cutters sold worldwide. Q.E.P. was the first to introduce the twin-rail ceramic cutter to the United States, and has pioneered many of today's most popular ceramic tools. Roberts Consolidated Industries was founded in 1938 and is the premier brand of carpet installation tools and accessories across the globe. Roberts invented many of the most common carpet tools that are in use today as well as Smoothedge™ tack strip. A broad selection of hot-melt seaming tape and a comprehensive line of flooring adhesives round out the Roberts line of quality products.